Just downloaded the Bandwidth Manager trial version on my win 8 PC. The product looks very interesting and I am trying to see if it will meet our needs. 1. Rule 1 - block all YouTube streaming traffic ( only the streaming not other traffic). Could I use the DPI field to do that? 2. Rule 2 - Block all YouTube traffic. Unfortunately there isn't really a way to allow browsing YouTube while streaming is blocked. However, you can block YouTube completely in two ways. The effect is slightly different. Method 1 will abort a connection as soon as it detects YouTube. Method 2 will not allow a connection to be made. Here is what not clear to me. 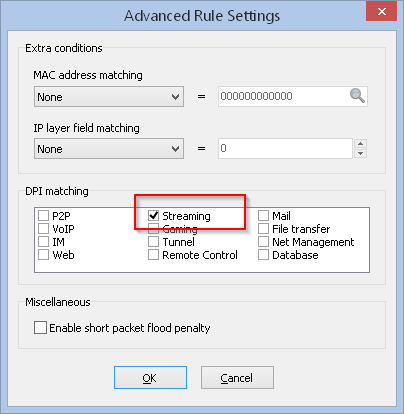 If I block all traffic from all Interfaces/Protocols/Ports and also check the DPI - Streaming checkbox. Would the BM block only the Streaming traffic or all traffic? It will only block streaming traffic, and possibly streaming web-sites (the services that are selected in the global settings). However to reduce the amount of traffic analysed by the DPI filter, I recommend to limit it to IPv4/IPv6 TCP and UDP traffic.